Baggy Jeans | Cosa Mi Metto??? Even if you I'm a skinny lover, I often like to change the model of my jeans and play with their shapes. The ones I'm wearing today, for example, is quite wide and soft and has a low crotch: this model is called baggy. The baggy jeans are a typical item of the street style, that came first with a masculine connotation, but that was later also adopted by women. I have paired it with a bomber in a ultra-feminine version: made entirely of macrame lace. 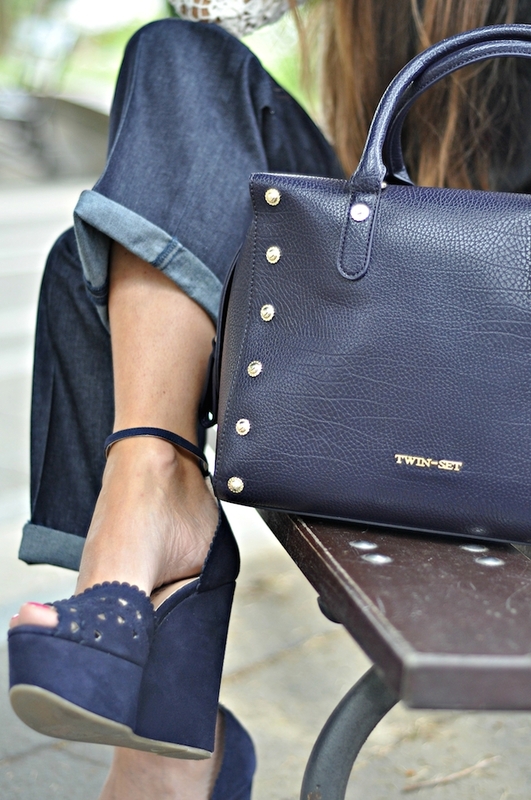 As accessories I chose a blue bag decorated with small studs, same color of the suede wedges with waist strap. Anche se sono un'amante degli skinny, spesso mi piace cambiare modello di jeans e divertirmi a giocare con le loro forme. Quelli che indosso oggi ad esempio, è abbastanza largo e morbido ed ha il cavallo basso: questo modello è chiamato baggy. I baggy jeans sono un capo d'abbigliamento tipico dello street style, nato prima con una connotazione maschile, ma che poi è stato adottato anche dal mondo femminile. Io l'ho abbinato con un bomber in versione ultra-femminile: interamente realizzato in pizzo macramè. Come accessori ho scelto un bauletto blu crepuscolo decorato con delle piccole borchie, dello stesso colore delle zeppe di camoscio con cinturino in vita. Looking so cute in this outfit! Love these wedges. With so beautiful body shape, all outfits are fantastic on you! Like your lace cardigan and bag!! I think you look great. I love your jeans. Lately when I am not at work I have basically been living in my boyfriend jeans. I love baggy pants, I really do. But here in the arctic winters of Chicago, only skinnies will do because they can be tucked comfortably inside your boots. For summer, though, baggy is best. Such an amazing look!! And the photos are stunning!